I am sharing my most recent flannel story board creations. There are several places I go to for inspiration and I especially love the Flannel Friday group which has a fantastic Pinterest page. I’m excited to participate for the first time with Flannel Friday! I also can’t take all the credit for the designs, templates are a life-saver! I can definitely tell my first pieces from my more recent items and I was a bit intimidated after seeing so many awesome craft projects. I didn’t think I could create them as nicely as the examples… Yet, now I am hooked on making flannels! It takes some practice to cut the pieces just right and to use the Sharpie markers to add life to the object. I love the interaction they bring to my storytimes, and they allow the children to become involved in the activity. The flannels are especially good for those young ‘helpers’ in the class as it gives them a task. I’ve also been using flannels because there are so many early literacy concepts to be introduced through such a simple technique. In just these few projects included in this post, I was able to do colors, numbers and counting, sounds and actions, and concept recognition. This toothy, yet adorable, shark made for a great pairing with 5 little fish. 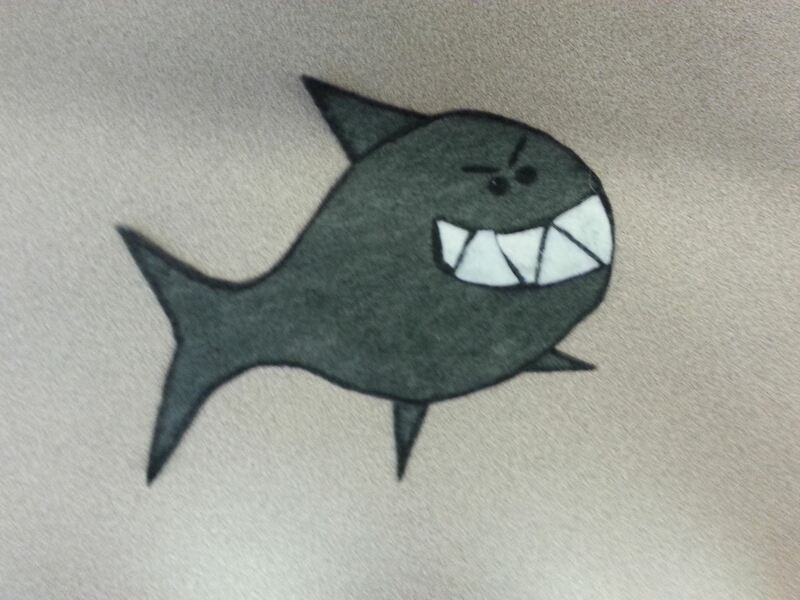 I also used a shark puppet in combination and it made for fun storytelling. I found the crayon template and was immediately excited to do colors. I stuck to the basic rainbow colors. I created the crayola box from a generic online image and added my own colors and design. 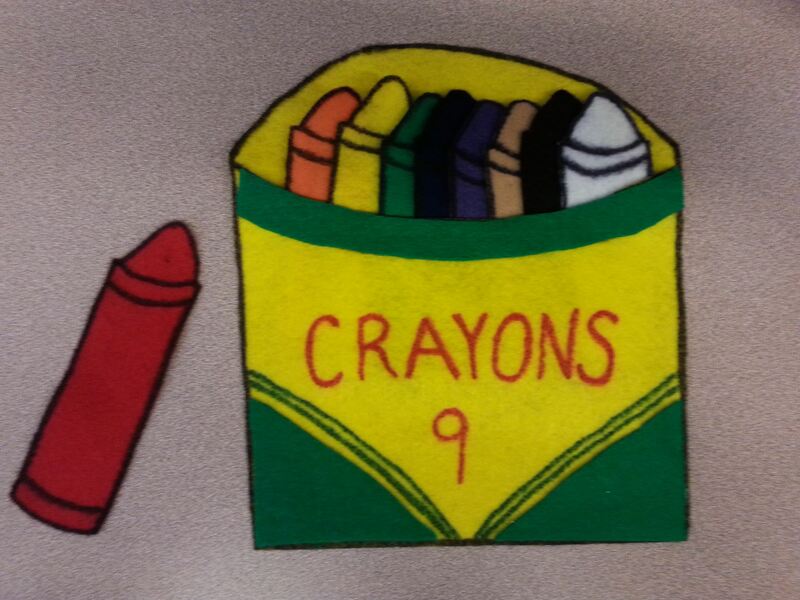 I also cut a slit to create an opening for the crayons to be taken out and then put back inside. It worked really well and the kids enjoyed being able to take out and put back the crayons. My take on “5 Little” racecars. I used these for a “Cars, Planes, Trains” themed storytime as part of the Summer Reading “Have Book, Will Travel” theme for 2013. The kids enjoyed making race car sounds and driving the little cars on the board. 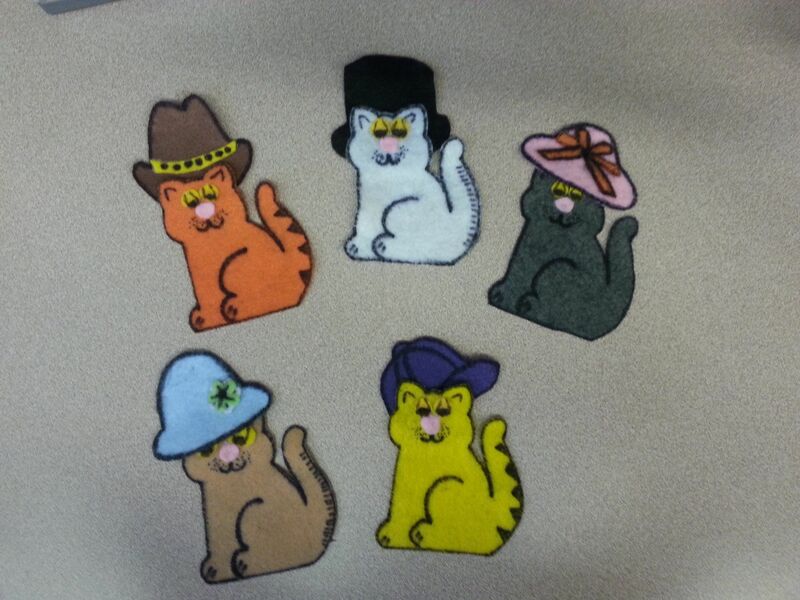 Five Little Cats with Five Fancy Hats. 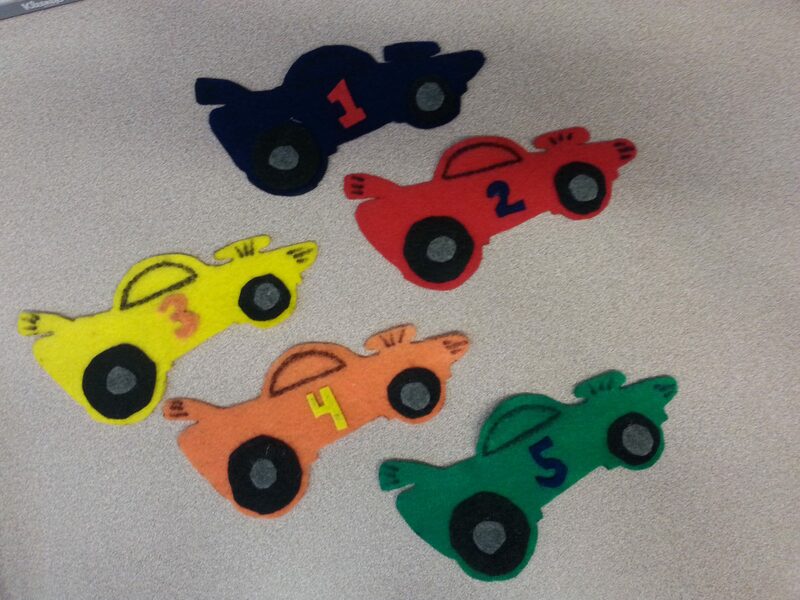 There are many adaptations to use with this story including colors, numbers and clothing. Adapted from “Tell Me a Story” online. Put on their hats and went to the park. 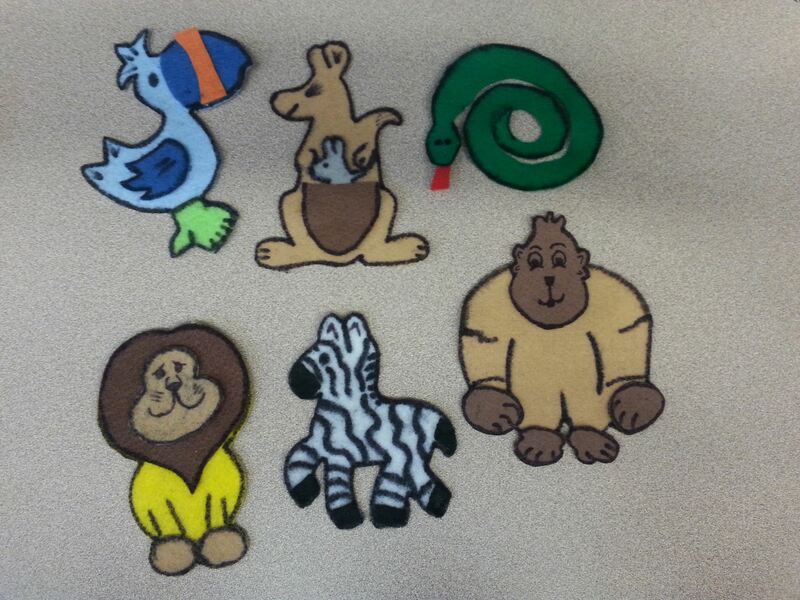 I created these zoo animals using various templates I found online. They worked great in conjunction with the 2014 Summer Reading theme, “Paws to Read.” I was able to not only do colors and numbers, but types of animals, animal habitats, and animal sounds. It really helped expand on the animal idea. 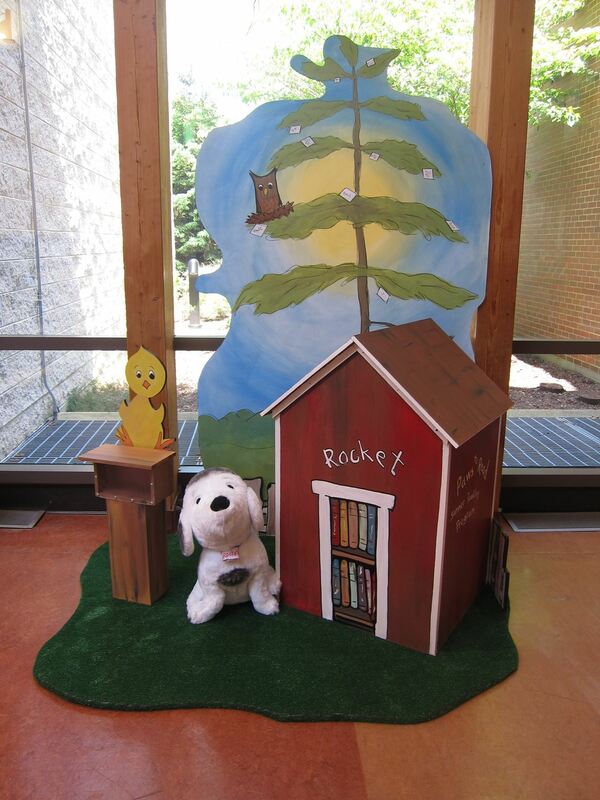 The theme this summer was Paws to Read, and what a versatile and fun theme for the youth services librarian! I had to create an idea to informally display the progress of kid who finished the summer reading program. There were many ideas that my fellow librarians and I discussed, but I kept coming back to this thought of dog bones. The children would write their name on a dog bone and we would feed Rocket the Dog. Rocket was a large plush stuffed animal who was cozy and welcoming. The hugs and smiles he received over the summer was immeasurable! We needed a place to display Rocket and his food, so of course, the only solution was a doghouse. I contacted the local Home Depot, who was often very generous with kids building programs, and asked if they would be willing to donate supplies or knew of someone we could hire to build the doghouse. They volunteered a wonderful local artist who creates displays at their store! He and I met to discuss the idea and our display challenges such as space and size. What a fantastic doghouse did we receive! Rocket had his own mailbox with a hinged lid so kids could put their bones inside and we could visually track the progress of all the ‘food’ he was eating. The characters from his book were also with him, and he even had a little white picket fence around his art. The simple idea of a display turned into a complete art exhibit installation and I was so proud of the results and impressed with the artist and partner support! Update! These have been so successful, I’ve added new packs to the collection. I Love Cats and I Love Dogs are additions for the Summer Reading theme of Paws to Read. Winter Weather Fun; added over the winter and includes the Frozen soundtrack! I held the first sensory storytime at my library this afternoon and I’m so excited at its success. The idea behind this unique storytime is to incorporate the five senses into the program for children who may have special needs or have processing issues. There were 4 children in attendance, two children did not speak English and one was on the Autism spectrum. The theme was FISH and the kids loved it. I incorporated touch and hearing elements into the stories and songs. We sang songs, blew bubbles, swam like fish and played a fishing game. The game was designed to help kids with fine motor skills and of course, to be fun. Overall, a great experience and I hope this opens the door to more families and kids. I am holding two more sessions, one in October and one in November. I incorporated the Library’s Ipad in my beginning reader storytime tonight and it was a huge success. 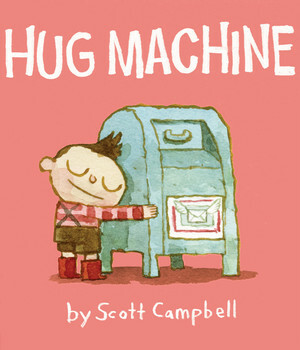 I wanted to use this storytime as an introduction to the idea of digital literacy. We first had a conversation about what an Ipad and tablet was and how their teachers use smart boards in the classroom. I wasn’t surprised at all they knew about digital devices at such a young age and we talked about the different mediums. What also interested me is that while the kids know about the internet, tablets, smartphones, etc. and many knew how to use them, they didn’t understand the differences of the products or what everything does. I also talked to them about how as they learn to read, using a real book together with an audio, playaway or Ipad app of the same book can help them learn. They thought it was the coolest idea and I got a room full of ‘ooooooh’s’ I also pulled actual copies of the books we ‘read’ aloud with the Ipad and they literally RAN to the back counter of the storyroom to check them out! I am really excited at how this simple technique got these kids so excited about reading and I plan to use the idea again! Adventure Packs are here and have flown off the shelves! I am thrilled that this new collection has been so well received by patrons. There are 10 total packs. Each pack comes zip tied in a clear plastic backpack and has a descriptive label listing what’s inside. The packs are themed and each has a variety of books, games, puzzles, toys, and music CDs. Each pack includes brand new items.